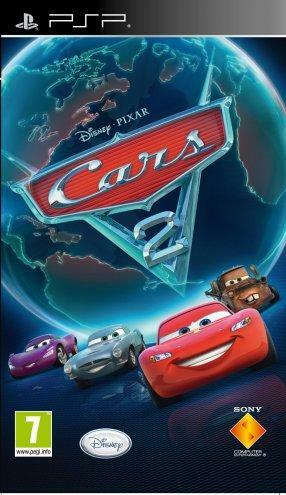 Cars 2 and its predecessor, Cars, have to be considered the weakest Pixar movies that have been created. It doesn’t mean it is terrible, but, compared to the Toy Story trilogy, The Incredibles and even Monsters Inc., Cars and Cars 2 didn’t have that Pixar magic or not enough of it. The only thing that Cars has is the merchandising juggernaut it seems to be pulling. With that in mind, it is no surprise that a game based on the second movie has been created for every platform out there, including the Playstation Portable, which the spotlight is shining upon. Is it a good portable outing or will it follow the mixed reactions that the franchise is receiving? 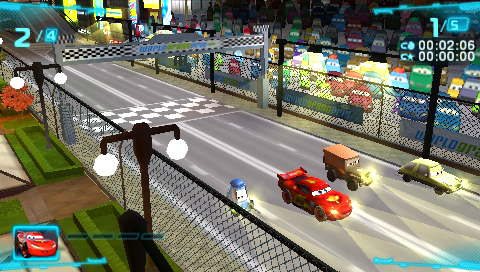 The gameplay is that of a typical racing game. You hit the accelerator and race around a track with three other cars, making each race a four car race. The accelerator resides on the R button and the brakes are used with the L button. However, expect your L button to gather dust as the cars will automatically turn corners, requiring no skill in actually controlling the car. The cars also have two special abilities: a shield to protect from barging and a speed boost. However, they won’t come into play all that often due to the fact that they really are not that necessary. The cars can also jump so that they may leap over obstacles. Of course, the alternative is moving to the side. Expect five race types when you progress throughout the game: Race, Attack, Battle Race, Elimination and Against The Odds. Each of the race types is very different in terms of gameplay. Race is basic four car race, including you, while Elimination adds the stipulation where the last place car on every lap is eliminated. Although it offers different gameplay experiences, don’t expect to jump into one of them because, with the exception of Race, they will be locked. To be honest, this is a poor decision. The game is tailored to children, who would want to jump into the game. They would lose interest in the game if one type of race is only available. Then again, this is Cars and the name itself will make the biggest child fans throw a tantrum. In Cars 2, there is no story mode, or an obvious one at that. Instead, expect a mode known as the C.H.R.O.M.E Missions. This was somewhat surprising. This is a film based game, so it would be expected to include a mode where the player will be following the film’s basic plot. But if that did occur, the game would have a focus on Mater, since he was the focus in the film. So, in a way, C.H.R.O.M.E does focus somewhat on the film’s plot. Why? 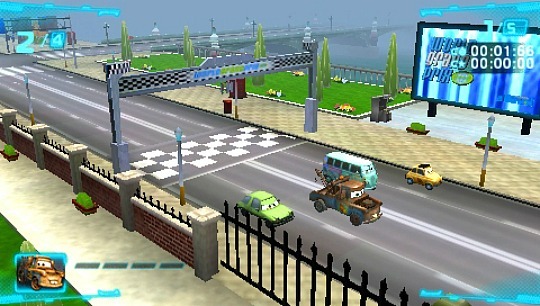 Because, after some tutorial levels, the player must go through five clearance levels, each with their own missions usually based on one of the race modes. Although the children may enjoy it, overall, it was quite boring. If not the change of the type of race and the fact that you can collect medals and badges, then this would have been a big time waster. If there is one frustrating element, then it will have to be the camera. Instead of the usual behind the car type of camera, the camera is a 3D isometric perspective. It follows the action, swinging around when the cars go around the corner. It isn’t that bad, however, this camera did take me by surprise. Granted, the cars, in both the game and the movie, look like toy cars. The problem continues to build with the abundance of obstacles littered on the track. Sometimes, the obstacle can be seen beforehand. Note that I say sometimes, because there will be times where the camera will not do its job, inevitably causing you to crash right into an obstacle you did not anticipate. This is down right frustrating when the camera does not do its job. To make matters worse, this is the only camera available, so expect a lot of frustrating playthrough. With the audience in mind, the gameplay has to be tweaked to suite the young ones. This provides a problem for those of an older age, but I don’t see anyone above the age of eight to play this game, so they can get away with it. 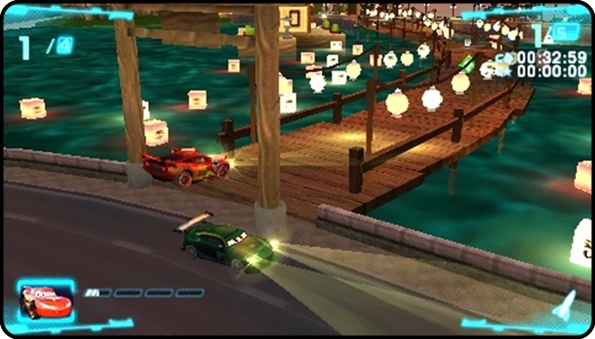 One particular element of the gameplay, however, which is frustrating, is the ‘rubberbanding.’ For those who don’t know what ‘rubberbanding’ is, ‘rubberbanding’ is a term where it describes the element where the AI cars will slow down for the player, allowing them to catch up, no matter the difficulty. It also works the other way, the player will never gain a great lead because the Al will suddenly speed up and cut their lead very quickly, ending with too many close calls. 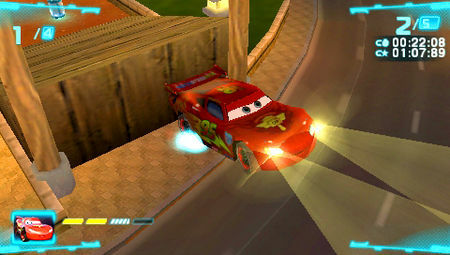 What Cars 2 have, compared to the more modern games, is that it is full of colour. All of the familiar cars that your child would recognise are here, including the main character Lightning McQueen and his faithful friend Mater. The details on these cars are finely done, considering the hardware. The environments are also visually enticing. Menus are easily to navigate as well, complete with a bland light blue backdrop. When the game is booted up and throughout the course of the game, you will encounter CGI cutscenes which are visually spectacular. Yes, I just said something is this game is spectacular. Audio is average, with limitations on the dialogue of the characters, usually only to those CGI cutscenes. The game is not broken or unplayable. If your child is a big fan of the Cars franchise, then purchase this game for them. However, for every one else, stick with Mario Kart or something else. The gameplay is quite boring despite the variations of the same race, there is no cohesive story, the type of camera used was the wrong choice and adding ‘rubberbanding’ was a misstep. While the visuals are somewhat of a redeeming factor, Cars 2 for the PSP should only be touched by those who find the mediocre franchise good or parents who want to keep their kids quiet.